Think about the regions on your list when you think of famous BBQ. Memphis? Kansas City? Carolina? Texas? Probably not Scottsdale. Sterling Smith is a champion pitmaster who’s been competing on the BBQ circuit since 2009. Sterling moved to Scottsdale after some time in the Navy, and since then, he’s been building his own BBQ business in the middle of the desert. But Sterling’s southwestern locale isn’t the only thing that makes his BBQ unique. The process he uses is a little different, too. BBQ is typically thought of as a slow-cooking process at low heat, but Sterling flips that idea on its head. According to Sterling, he can get the same result much quicker when he cooks hot and fast. All it takes is a strong handle on air flow and a familiarity with target meat temperatures. 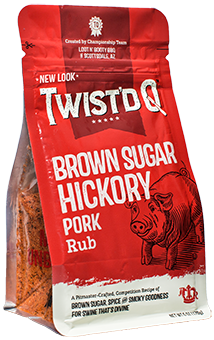 Pork is the protein of choice for Sterling, so when Twist’d Q™ reached out to him to partner up on a new rub, he had a lot of flavor to bring to the table. The resulting Twist’d Q™ American Royal Pork Rub is a little sweet, a little salty and a little spicy. And it’s straight from his recipe that won first place at the American Royal World Series of Barbecue®. Sterling wasn’t always a professional pitmaster. He spent years as a commercial banker, and it was his bank that would eventually lead him to BBQ. The bank held a BBQ competition every year, and as an adamant griller, Sterling felt he’d be able to hold his own. Once the competition started, he was in awe of the whole culture. Teams smoking meat, drinking beer and telling stories. Growing up in the South, he knew BBQ, but the culture around the competition added a whole new level of inspiration. Fast-forward to now. Sterling and his wife Molly have been traveling the country on the competition BBQ circuit for almost 10 years. In that time, they’ve managed to fill their garage with trophies and medals. What’s it like to get your name called so many times? Sterling says it’s all about validation. Validation that what you’re doing as a hobby and profession is something that brings joy to people. That gives him the confidence to carry on and do more. Make more meat, teach more classes and continue to learn. Find Sterling’s Championship Rib recipe here.